Some operas and plays have obvious villains. Méphistophélès in Faust is literally the devil; Hansel and Gretel features a witch who has no qualms about baking children in her oven; and Salome has any number of options, from the bloodthirsty Salome herself to Herod to Herod's wife. But while it is true that Fry (masterfully played in the performance I saw by understudy Paul La Rosa) does fall on his own knife, which he intended for rival Curly McLain (John Cudia), Oklahoman society has set Fry up for failure. Having tried in vain to make connections with his peers, Fry is more of a tragic figure than an evil rascal; he has worked an honest job and saved a small fortune in the hopes of taking Laurey Williams (Ashley Brown) to the box social only to be rejected. If the story of Fry's desire for Laurey threatening the latter's true love for McLain is a tired one, the context is unique. The territory of Richard Rodgers and Oscar Hammerstein's Oklahoma!, set in 1906, is on the verge of becoming a U.S. state, and the characters are keenly aware of the magnitude of the transition. "The Farmer and the Cowman," for example, exposes the mutual suspicion and distaste of the relatively stable farmers and the more nomadic and chaotic cowboys. The best compromise that the two can broker -- knowing that they will need to act as brothers when Oklahoma becomes a state -- is "I don't say I'm better than anybody else/ But I'll be damned if I ain't just as good!" 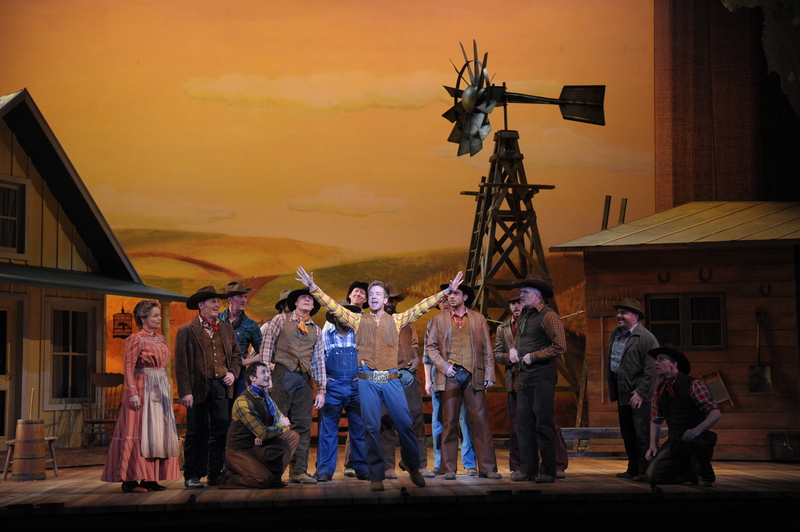 Whatever the inspiration, the set's depiction of 1906 Oklahoman territory is almost convincing enough to make viewers forget they are in Chicago, and indeed several cowboy hats and boots could be seen in the audience. With a full orchestra set in the Lyric Opera's beautiful theater, the production -- which incorporates aspects of musical theater, ballet, and opera -- feels very grand. In the Sun-Times, Hedy Weiss says the production "attempts to be intimate, but is caught up in opera house scale," but I'm not sure that's a bad thing. One gets the sense that the songs were composed for a big stage like the Lyric Opera's, where performers like Curtis Holbrook (Will Parker) shine. And after all, whether a show like Oklahoma! belongs in an opera house on such a grand stage might be inside baseball to many people, who will get lost in the show's great songs ("The Surrey with the Fringe on Top," "Kansas City," "People Will Say We're in Love," and "All Er Nuthin") and not pay too much attention to the venue.